Lights on a deck at night create a warm glow and ambiance. Lights in the shape of buildings create architectural ambiance. Check out these terrific acrylic deck lights which sit on fence railing posts. 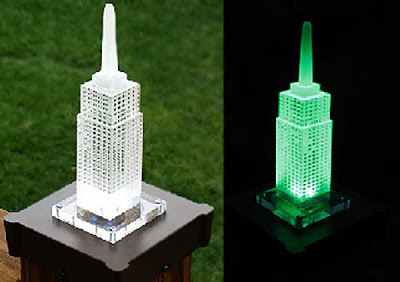 Lit with LEDs, they are approximately 3.5" wide and 6" tall and can fit a variety of fence post sizes. Created by Moonlight Decks, each light is $175. What a great idea for the architectural enthusiast. Have you seen other architectural products for in or outside the home? Let us know via the comments link below. Thanks for putting this link up. These deck lights are fabulous. I can see them outlining my deck when I hit the lotto!